Eurotrash, Part I: 2000-2004 is here. Eurotrash, Part II: 2006-2010 is here. Ten years ago Andrei Nazarov ranked 4th in the NHL with 229 PIM. Fellow Euro Krzysztof Oliwa was 17th with 165 PIM– a four season low (not to be confused with Reed Low) for the former Devil who once racked up 295 PIM in a 73 game season. Nazarov and Oliwa are both retired in 2011, Oliwa now in Poland and Nazarov now the coach of the KHL’s Vityaz Chekhov (home of ex-Flyers Danny Markov and Josh Gratton, by the way). Ulf Samuelsson is now behind the Coyotes’ bench; Darius Kasparaitis is now coaching SKA St. Petersburg (with Alexei Yashin, Sergei Zubov, and Maxim Afinogenov, among others). Even pseudo-European Owen Nolan (born in Ireland, grew up in Ontario) is a ZSC Lion. How bad is the current NHL as far as Euro-goons are concerned? очень плохо! No European player broke the 100 PIM mark this season. Below are the final 2010-2011 totals. New Duck Jarkko Ruutu wins his third Euro-PIM title, two fights ahead of Chara, who scores his 10th consecutive season among the top 10 but still hasn’t won a title, despite his best efforts. The Demolition Man, Tomas Holmstrom, makes the top 10 for the first time ever– bad news for Euro-goons based on the low PIM total the Red Wings post-Probert and Kocur tend to incur. Smid (who actually led much of the season) and Sobotka are also Euro-rookies among the top 10. Koci racked up 80 PIM in only 35 games, by far the lowest number out of any of the above Euros, meaning were the Avs any worse (meaning, were the Avs the Oilers), Koci could perhaps have topped 100 PIM. Still, Koci at 100 PIM would be 40 PIM behind his career high, and 200 PIM behind Oliwa’s. An era is over. 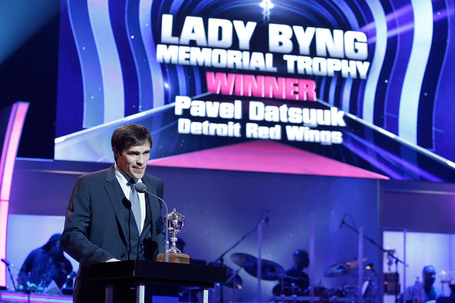 We are all Datsyuk now. This entry was posted on April 12, 2011 at 2:45 am and is filed under Flyers-related. You can follow any responses to this entry through the RSS 2.0 feed. You can leave a response, or trackback from your own site.